Provide the best possible psycho socio economic services for Persons with multiple and locomotor disabilities attending the Institute. This is done by involving and mobilizing the inherent potential and resources within the patient, family and the community through the Interdisciplinary Team Approach. Enrich the collaboration and cooperation with Schools of Social Work, P.G Depts. of Social work and Disability Studies, other Government & NGOs related to Health, Education, Welfare and Development Institutions. Socio Economic assessment of patient and family. Interpretation of treatment /Rehabilitation Programme after evaluation in all departments and coordinating with rehabilitation team regarding management. Case work counseling, short term and long term, with special reference to disability, both individual and family depending on the type/ severity and the treatment advised. Group activities for all age groups with the purpose of recreation, education and therapy. Evaluation and provision of financial assistance in the form of subsidies for aids and appliances manufactured in the Institute and in the local Market as well as medicines and investigations. Referral services to community resources for financial assistance, educational assistance, school and institutional placement, family services etc. Transport services for patients on regular therapy / Rehabilitation programme. Home Visits for evaluation and follow up. Participation in interdisciplinary Case Conferences/ Ward rounds/ Cerebral Palsy Clinics/ Follow up Clinics, Special Clinics. Coordination with community Resources for the integration of PWD in the community. 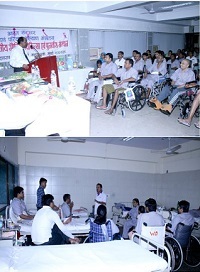 Conduct / Participate training/ teaching program for persons with disabilities and their families. Teaching at all courses conducted in the Institute viz PT/ OT/ P&O. Teaching and field work supervision of post graduate Degree Students from the College of Social Work, University of Mumbai and Tata Institute of Social Sciences and/or other Universities. Conducting PG courses for Trained social workers. (under process with MUHS & RCI). Attending and presenting papers at Seminars, Workshops, and Conferences at Regional, National and International level. Studies concerned with Socio Economic Cultural aspects of Disability and Rehabilitation in the area of Education, Employment & Family Adjustment. Donations are accepted for poor and needy patients/persons with disabilities in the form of cheques and demand drafts in favour of Director, AIIPMR/All India Institute of Physical Medicine and Rehabilitation, Mumbai.